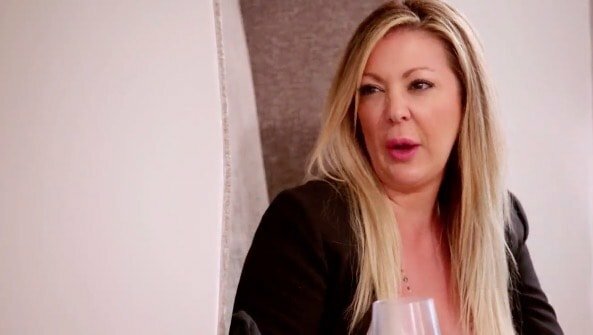 On last night’s Second Wives Club, a gobsmacked Veronika Obeng continued to wrestle over what to do with her marriage, Shawna Craig was the girl who cried broke and couldn’t afford more head shots, and Tania Mehra tried repair all the relationships she sunk. In Katie Cazrola‘s world, she refuses to be Walter’s trophy wife, because she actually wants to be his sugar mama! Walter is on board with this: he’ll sit home tinkering on his piano with big dreams of making it in music, while Katie runs two successful businesses and pays the bills. After last week’s disaster with Hi Societea, Katie is refocused, and contrary to Tania’s accusations that she doesn’t do modeling or TV, Katie films an appearance promoting her nail salon and nail polish collection. Wearing a bike helmet festooned with Christmas decorations,while running an obstacle course, Katie shows off her”Red Bottoms Up” nails. That color reflects the after affects of Katie’s wine consumption. Of course it’s better than ‘In The Red’, which is where her finances stood while she was living in her car. Which is kinda where Shawna is finding herself these days. After her first attempt at head shots were dismissed by her agent he’s demanding new ones, except with no job except being Lorenzo’s fourth trophy wife – the one left over after all the alimony has been consumed – Shawna can’t afford them. Like the chicken or the egg – does the head shot or the acting job come first? Lorenzo is off in Vegas, and he resents that his wife is trying to live his failed dreams in LA. He expects her to get a job and contribute to building their house. Instead Shawna has been gathering sticks and trying to make a little home away from Lorenzo, but he huffs and puffs and demands she run all the way home and blow her dreams down. Shawna isn’t ready to give up. So she’ll cry into her FroYo until someone else comes along and saves her. Might that be Morisa Surrey with her magical chicken burritos? Made with breastmilk?! I mean honestly what was that woman even doing? At Shawna’s “crash pad” she and Tania were lamenting that no one likes Tania anymore and no one wants Shawna to win at head shots and life when Morisa shows up with “lunch”. She’s carrying a couple just pumped vials of mama’s milk and a grocery bag full of tortillas. Meanwhile over at Shiva Safai‘s magical palace of magical realism, she and Mohamed enjoy a gorgeously arranged fruit salad sitting on the lanai at their formally-laid garden table. I personally think Mohamed should ditch Shiva and marry Pat Atschul. Those two are soul mates, but he hasn’t realized that yet as he gently dabs away the infinitesimal fleck of blueberry stuck in Shiva’s teeth. Back to sad-reality, Morisa was inspired after learning to cook at Veronika’s BBQ and decides to make lunch. Which means dumping 10 tortillas in a frying pan, lighting every burner on the stove because she can’t find the the oven, then absentmindedly patting the tortillas with a spatula until they’re burned. It’s kind of a euphemism for Shawna’s life actually. I mean, Lorenzo has lived four fantasies and threw Shawna into the frying pan just when his life was starting to burn. RELATED – Catch Up On Last Week’s SWC Episode! I really don’t get Shawna – does she think she’ll get head shots and everyone will be like, look – a Unicorn! Give this girl a major motion picture and an Oscar?! Shawna is so desperate for money she jokes about getting on the pole. Tania shrugs like, Don’t knock it till you’ve tried it! If the former Miss India Laguna Beach Mall can do it and find her prince Dean-ing anyone can. Except Katie… she doesn’t do runway. But it’s probably a recipe for success even Morisa could master, right?! Ugh Tania. Tania recognizes she’s being iced out of the ‘good group’ and better fix things lest Shiva stop inviting her to fancy parties. Well, let’s talk about Veronika for a while. Michael is avoiding her like she’s the one who cheated. Even weirder, Michael hopes to save the marriage and wants Veronika back . Yet the only thing he shows his wife is his backside as he scurries out the door for forever long hours at the ‘office.’ Veronika’s sisters chastise her for letting him get off easy. They expect her to handle this problem like Katie would, with a little wham, bam, poisoned manicure, ma’am! But Katie has her hands full – literally. She’s so busy she needs to hire another assistant, because her previous assistant turned into her office manager. Walter suggests Katie search for a butler named “Fortisfoy,” who naturally comes attached to a little bell Katie could ring whenever the dog needs letting in or out, or the friends do. Maybe Shiva has a butler to spare? Katie and Walter yell “Fortisfoy” into the air – cause if you call them, they will come. But the halls of The Painted Nail remain barren of butlers. So Katie is reduced to putting an ad on Craigslist which yields such stellar results as a person who claims “philanthropy” on their resume, yet doesn’t know what philanthropy is. Another candidate is an older woman who raps (from home) and is only applying in the hopes of getting free mani/pedis. Later, when Shawna comes over to bemoan that Lorenzo is grounding her for missing curfew, Katie takes it as sign to hire Shawna as her on-call personal assistant. 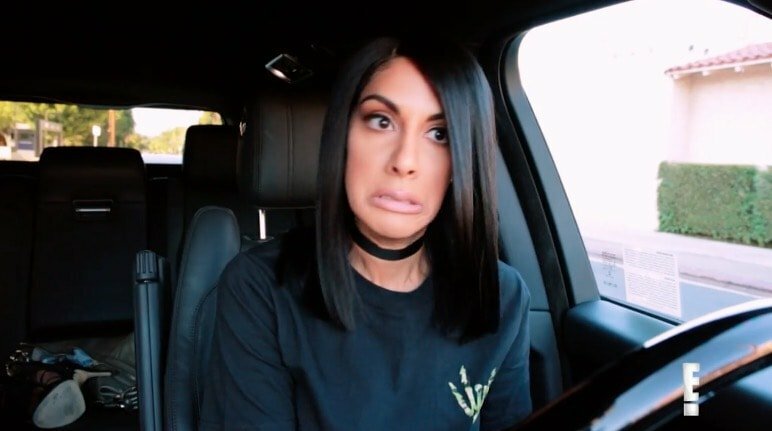 Considering that Shawna can’t brush her hair, put on makeup, or find a cheap photographer on Facebook, and her only skills appear to be patting Lorenzo’s ego while marveling at amazing newfangled inventions such as the Range Rover, I wouldn’t trust her to manage anything of mine. Immediately Katie regrets her decision. While Katie is perhaps pouring money down the drain when she expects Shawna to pour wine in her cup til it runneth over, Veronika goes to see a man abut some money. More specifically she goes to see a financial advisor about what her post-divorce life could look like. In the cold stark reality of black and white, she’s told that no, a $5,000 per month shopping budget is not “frugal” and that she’d need to earn $4 million per year to keep up with the Michael’s. Veronika doesn’t know if she can do med school online, so she decides to write music instead. After all, it worked for Walter! Maybe he could turn her into the next Mariah. I love Walter! He’s so sweet and seems genuine, kind, and really fun. I think he and Katie are actually happy, which is nice. Anyway, clutching her trusty composition notebook, Veronika tiptoes through Walter’s door for her first music lesson. Her nerves are all aflutter! Walter is patient and is basically like, you have to start by actually singing, but here have this cocktail until you figure out the basics of when mouth opens, loud sounds must come out. Kind of like yelling, only more genteel. Veronika vows to practice and practice she does – on Tania. Oh Tania. A clueless one she is. Driving Dean’s Range Rover around L.A., she smiles that what’s his is theirs, and what’s hers…well she doesn’t have anything except her looks, so what’s hers is now everything that is his. And more! The only thing Tania doesn’t have is friends in high places. Later, while Veronika is visiting Shiva for perfectly arranged rosé, Tania calls to see if they can meet for chai to repair their friendship. Veronika only drinks coffee and doesn’t want Tania’s blessed day, but agrees to go anyway. Five seconds later, since she’s reading from a list of all the people she’s pissed off, Tania calls Shiva and recites the same invitation word for word: “chai, blessed day, positive energy, yada, yada, yada… ” Shiva accepts under the provision that Tania keep her hands where Shiva can see them and lets her do all the talking. Shiva does drink chai, but she doesn’t speak classless. Then Tania wanders over to Katie’s office, where she witnesses Katie doing something Tania’s never seen before: work. Tania assumed Katie sat in that place all day online shopping and snapping selfies. What’s Walter’s is not Katie’s – by choice! Katie is not pleased by the unwelcome intrusion – where is Fortisfoy to keep the riffraff out?! But she and Tania manage to talk out what happened on the boat ride. Tania claims she misspoke, meaning that she and Katie are simply in different industries, not that Katie is an unskilled model who can’t possibly relate to the world of Paris Couture week. RELATED – Shiva Is Not About The Real Housewives Lifestyle! With one successful confrontation down, Tania meets Veronika for a walk but things, well, things go very, very badly. Within minutes, they’re yelling on a street corner about who’s more ratchet. Tania throws Veronika’s failing marriage in her face and accuses her of being jealous that she’s getting married. “To a D-list producer from the 80’s,” shoots back Veronika. Somehow Tania has looked up Veronika’s real estate records and mocks her for owning only a $1.5 million dollar home. Veronika reminds Tania that she sleeps in a 1Br apartment, while she owns multiple homes. 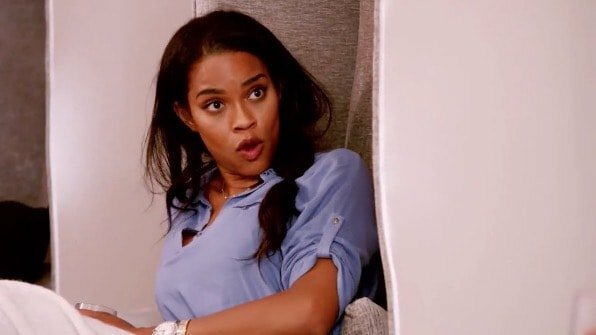 The nasty insults fly until Veronika decides to hightail it back to Bel Air and off these ratchet streets with their bad influences. She shoves her hand in Tania’s face to ward off evil, turns on her sparkly platform sneakers, and runs for the hills. Literally. You are the company you keep, and Veronika doesn’t want to be keeping company with anyone who compares her to a yappy dog and reduces her to verbal brawling over frappuccinos! Well Tania, better luck with Shiva, I suppose! TELL US – DID KATIE MAKE A MISTAKE HIRING SHAWNA? IS VERONIKA OVER-REACTING TO TANIA?